You may be planning on visiting the Isle of Wight to leave the daily grind at home and indulge in pure extravagance, and if this is so then we have plenty of luxury 5 star cottages for you to enjoy where the standard of accommodation is at the very highest. From tranquil retreats buried deep in the countryside to bright and airy ocean view cabins that welcome the fresh sea air, there is a luxury cottage for everyone looking to relax, unwind and have a great holiday in the Isle of Wight. 5 star self-catering cottages come with all the facilities you’d expect from such luxury lodgings. With private gardens, hot tubs, pools, in-built BBQs, large TVs and DVD players, Wi-Fi and fully equipped kitchens, the cottages are furnished stylishly and tastefully with soft beds to sink into, sofas with big, squashy cushions and warm, hearty log fires to sit by after an action-packed day out. There are plenty of things to do on the Isle of Wight, from a visit to the Needles Rocks and Lighthouse and its incredible coloured sand cliffs to adventure activities such as rock climbing, archery and fossil hunting. The island is full of things to do and it is very easy to have several jam-packed days in a row! To be able to return to a 5 star luxury cottage where all your needs will be met after a long day out is a wonderful treat, and something that can easily be done on an Isle of Wight break. Imagine submerging yourself under soothing bubbles and massage jets in your own private hot tub, or snuggling up under velvety blankets by the fire in your timber furnished log cabin – pure luxury! Luxury 5 star cottage holidays in the Isle of Wight will remain with you for the rest of your life and once you spend a week in one of these incredible cottages it will be hard to ever stay in anything less! The Isle of Wight makes for a great holiday with its miles and miles of glorious coastline, great restaurants and wonderful museums and activities. Have a browse through our Isle of Wight luxury cottages with all the amenities you’d expect in 5 star lodgings to make your break the most special one you’ve had. 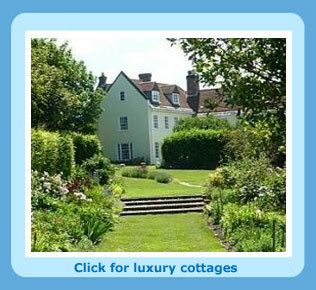 If you would like to cast your net further afield, there are numerous high quality luxurious cottages in Britain. A luxury cottage offers a level of comfort and charm above the rest. All fixtures and fittings will be of a high standard. One would expect large comfortable beds, at least kingsize or perhaps a four poster in a period cottage.. It is very nice when a holiday comes together and holidaymakers have a good time with hapoy memories..